Startseite » Was können Sie tun » Directions and routes in Georgian mountains. Travel Guides » Deda Ena Mt. Ski touring in the snow circus and peak of Deda Ena Mt., NE (northeast), E (east), 5 km., 05:00 h., 03:30 h., ↑ 700 (1200) m., ↓ 700 (1200) m., ▲ 3000 (3500) м.
Deda Ena is the name of an impressive peak west of the Gudauri Ski Resort, well-marked as a classic isosceles triangle. “Deda Ena” is translated from Georgian as "mother of the alphabet"; thus, the peak is named after the Georgian alphabet. The ski tour to the circus under the peak of Deda Ena is one of the most beautiful routes near the resort. The main mission - climbing the peak of Deda Ena (3,500 meters) - can only be accomplished by experienced athletes with the use of additional mountain equipment (ice axe, crampons) and a harness. But even the descent from 3000 meters, without ascent to the ridge and peak, has the possibility to be the best descent you experience during your holiday in this region. The closest route to Gudauri. An area of accumulation and preservation of huge reserves of excellent snow. With a northeast exposure, the circus is protected by sidewalls from external winds. The absence of ski lifts and a variety of descent options allow for the enjoyment of awesome powder, even a month and a half after a snowfall. From almost all points of the Gudauri Ski Resort, the peak looks seriously difficult for ski touring; from the highest point of the resort, the top station of the Sadzele lift, in the west, the whole large circus is very clearly seen, and the terrain and the majority of the route are viewed. The optimum line of ascent passes along very interesting terrain with different steepness of slopes. In general, though, it is possible to distinguish only two steep and more complex areas: the first one starts 30 minutes after the beginning of the ascent. For those who decide not to stop and ascend to the peak itself, during climbing the ridge, you will find the second area at the very end. The rest of the route passes along rather flat (up to 20º) slopes. The ascent line to the circus begins directly from the road on the other side of the Cross Pass. Before setting off for the route, please check if the Cross Pass is open - traffic through the pass stops after snowfalls and during periods of increased avalanche danger. Heading to this route is possible only in conditions of good visibility with a favorable forecast. In conditions of poor visibility ("white out weather") on the diverse terrain of this circus, you can easily lose visual landmarks and get into an avalanche area or into a rocky drop. It is necessary to pass steep and avalanche areas at a distance from each other. Before the first steep ascent to the ridge, located to the left of the central cirque crest, further transforming into a flat plateau, it is necessary to perform snow tests (avalanche pit). You’ll need to do this in order to assess the degree of avalanche danger, to decide on the further continuation of ascent, and to select a descent line. Check the level of avalanche danger before setting off for the route! Daily updated information on the level of avalanche danger can be found in the Gudauri Travel Bar (www.gudauri.bar). Ski touring / splitboard set., Crampons., Rope 50 m., Climbing harness., Ice ax. If the road through the Cross Pass is open to traffic, you can get to the route’s starting point by taxi in 10 minutes. A few kilometers after passing the highest point of the pass, you will see an old stone bridge on the left side. A little further, a few meters to the right, there will be a place to stop the car. You can return to the resort by taxi. Throughout the route there is a mobile network. Call the driver when you know you’re 10 minutes from the route’s descent, so he can meet you behind the turn and a little bit lower from the place where you started the ascent. The standard cost of a 7-seater car to drop you to the beginning of the route and to pick you up after your descent is 100 GEL. The route begins immediately with an ascent to a small slope located directly on the other side of the road. The path then flattens, and in 30-40 minutes you will find yourself in front of one of the spurs of the circus’ left wall. There are two ways to approach the plateau - go left through the gorge along the assumed water flow line and traverse further to the ridge at its upper part. If you go right, you will circle the end of the spur on the right side and behind. 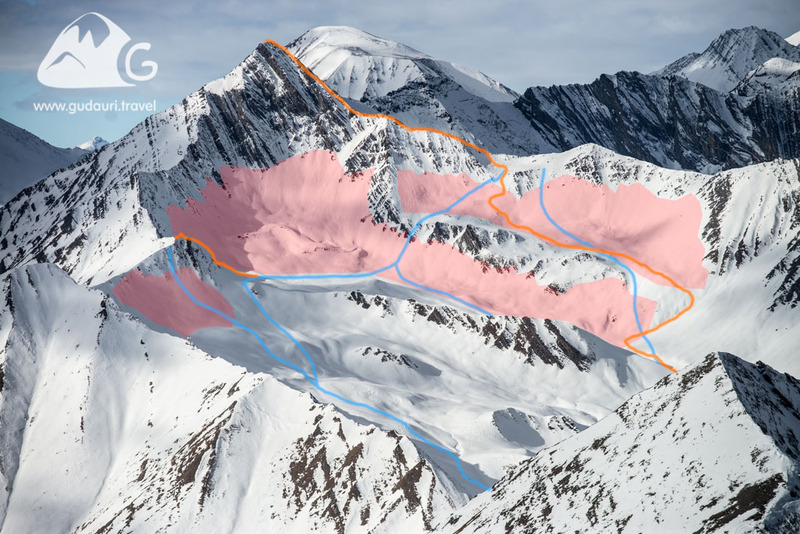 The choice of an ascent line to the steep spur depends on the general state of snow cover and the presence of potentially dangerous snow cornices at the top of the spur. The ascent options are marked in green on the map, and the descent options are in blue. The red zones on the map are avalanche-dangerous areas. When climbing the peak, leave your skis/splitboards at the pass of the Deda Ena mountain ridge (coordinates 42.52630, 44.43515). Further ascent to the peak - without ski equipment, but with the mandatory use of crampons, ice axe and harness - will take 30-40 minutes. In the upper part, immediately before reaching the peak, where there is a danger of the descent of large cornices, a harness is necessary. Confident skiing. Backcountry experience at least two years. Is the route accessible when the Cross Pass is closed?